Discover the splendors of Halong Bay aboard the Spice Cruises, a wooden junk that combines classic beauty with modern comfort. 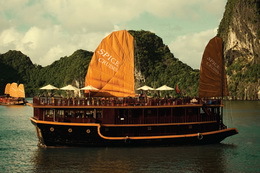 Designed with Asian traditional junk, with 10 cabins, Spice Cruises has been launched in August 2008 for small group tour or family travelers. This newly built, custom-designed yacht features three decks that house a luxury and elegant restaurant, a bar, a small library, and a massage area-plus ten luxurious sleeping cabins. With that much space, passengers can truly unwind in the best atmosphere. 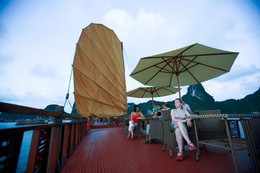 As one of the outstanding cruises in Halong Bay, Spice Cruises is luxuriously appointed. 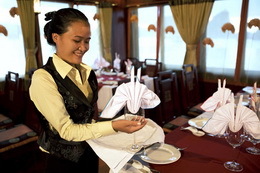 Offering four types of intimate, luxury, personal accommodation, fully-equipped dining room with Internet accessed computer, wooden bar with hundreds of cocktails, mocktails, air conditioning installation, passengers are sure to be pampered. Moreover, deluxe and Spice rooms with the best facility give you a special private space. 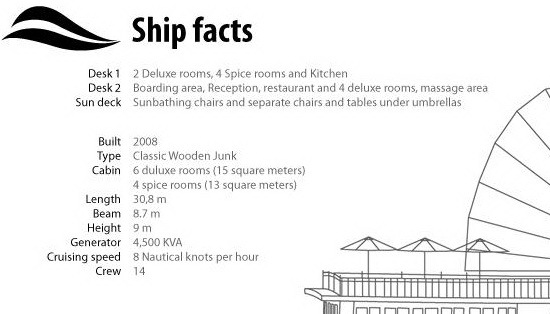 All cabins are decorated with traditional Vietnamese hardwood giving them a rich, luxuriant warmth. Choosing Spice Cruises not only for its luxury but well-educated and professional crew who are very friendly and hospitable, our experienced captains can take you to explore tranquil scenery in the safest conditions.